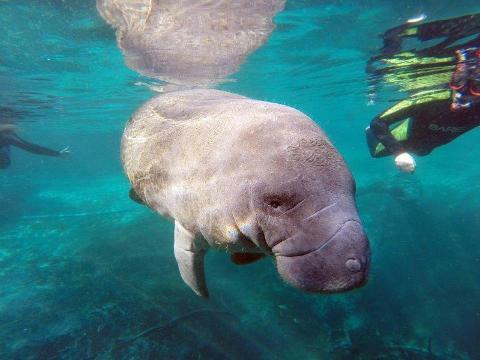 Crystal River offers the best location to see and interact with the Florida manatee, a subspecies of the West Indian manatee, also known as gentle giants. 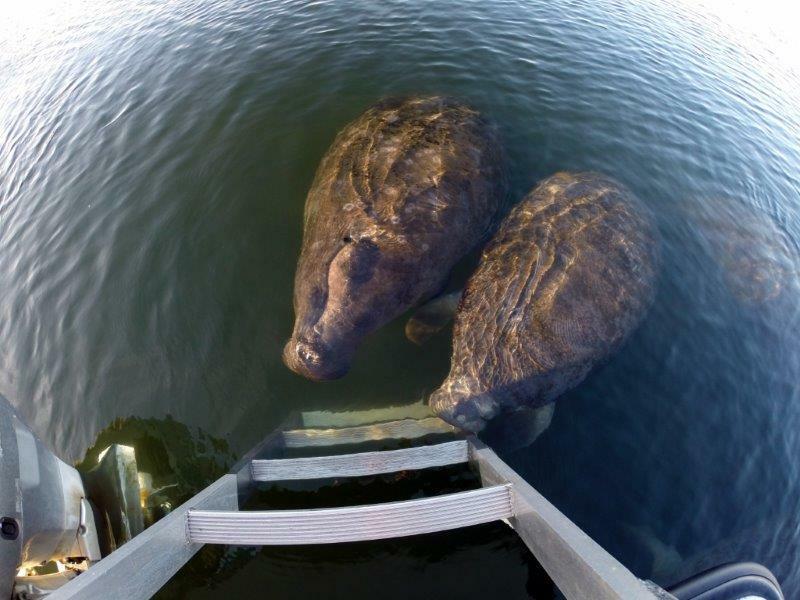 Unlike other areas of Florida, the federal government allows for "passive observation" in the water between manatees and people in Kings Bay. This allows face-to-face interaction with manatees. We provide pre-tour education on passive observation and how to get the best experience during the tour. 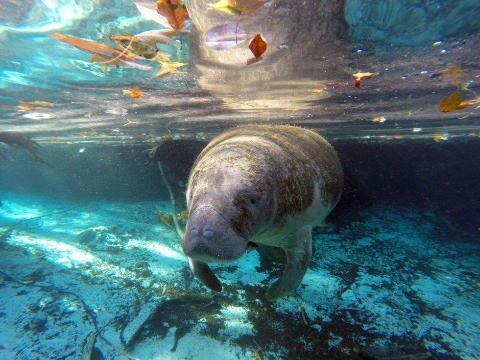 We also offer a hotel package including accommodations and breakfast with your Florida manatee tour. 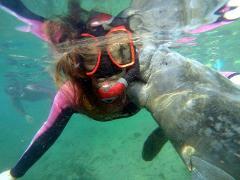 Swimming with the manatees and exploring the greater Kings Bay estuary and springs is extremely popular. Manatee tour experiences are best done by snorkeling while wearing wet suits, making the interaction as silent as possible. This way the manatees are more inclined to approach and get close. We maintain new suits and snorkel gear, all included in our manatee tours, as well as full-service facilities for changing. Your in-water guide will be taking videos and pictures of your manatee experience, which will be available for purchase at the dive shop. All our tour boats are fully enclosed in the winter time to protect you from the wind and cold. We provide coffee, hot chocolate, water and dry towels on every tour. All bookings are subject to a 7 day cancellation policy. Inside 7 days all booking are non transferable and non refundable. Manatee tours are temperature driven. The colder it is the more manatees we see, and the closer they are to the springs. 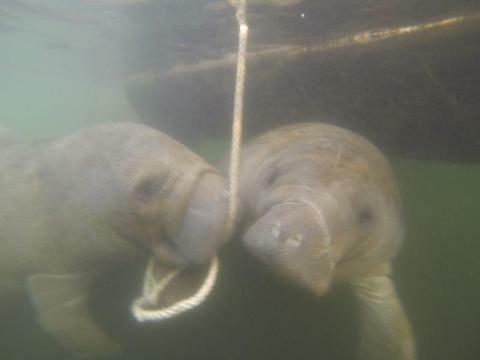 During cold days in manatee season (November 15th to March 31st) Kings Bay could have over 700 manatees. Please keep in mind that even inside manatee season we may have warm weather (summer like conditions). We see manatees in Kings Bay year round. To some this is their home and they'll stay here their whole lives. In the summer months, and anytime we have warmer weather, the temperature of the water outside the springs increments. This makes the rest of the bay more appealing to the manatees. The 20 to 40 manatees that stay here year round don't move together, so they'll spread out in the 630 acres of Kings Bay. This is a wildlife experience determined by weather, tides, time of the day, and the behavior of all visitors. When we have "summer like" conditions you have the opportunity to see manatees in their natural habitat, and it is important to have realistic expectations. We are always happy to answer any questions about what you could expect inside or outside manatee season. What is the best time to go on a tour? the most opportune time. Manatee tours are temperature driven, the colder it is the more manatees we get to see. What age is required for kids? We do not set a hard age requirement for children. Things to consider include the fact that all customers must wear a full wet suit. We have child's suits down to a size six. Also, everyone in the water must remain calm and quiet at all times when around manatees. Children must be accompanied by an adult at all times. Is this a guided experience? Yes. On every tour we have a USCG licensed captain, and a certified and insured dive professionals guiding you on the refuge and in the water. All our captains and dive professionals are trained in first aid, and CPR. Our in-water dive professionals are also rescue certified. 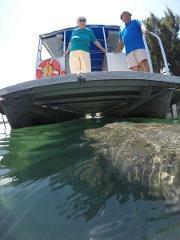 All our captains and guides are all certified eco-tour guides through the Manatee Eco-Tourism Association (META). This helps us stay up to date on current manatee research, rules, as well as the hydrology of Kings Bay. The most important thing for us is your safety, followed by the safety of our manatees all while educating about our manatees and ensuring you have a once in a lifetime experience. Our in water professionals are also taking pictures and videos of you experience, which are available upon return to the shop. How cold is the water? air temperature ranges from 40–50 degrees at night and 60–70 degrees in the day during the manatee season. Our boats are enclosed for comfortable sightseeing! How close are you to the manatee? "If the manatee were any closer, they would need room keys." The manatees will dictate our experience. They could be a couple inches from you, or we'll observe them from afar while they carry on with their daily activities like eating or resting.Manatee tours take place in Kings Bay (600 acres with a two-mile diameter). Kings bay is home to the largest concentration of manatees in the world. This is the underwater interactive experience of a lifetime in Crystal River! 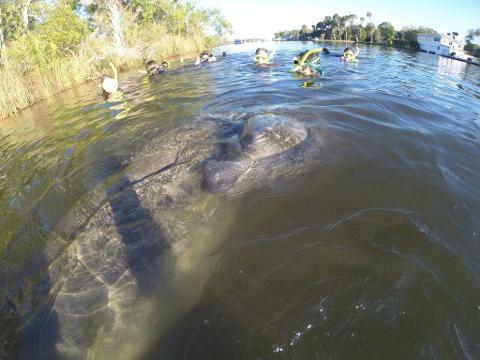 Are we safe swimming with the manatees? Manatees are curious and playful when you are quiet and let them initiate interaction. 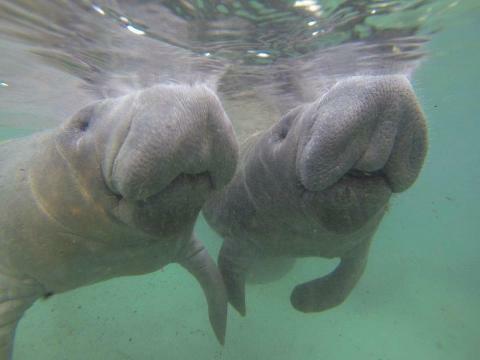 We show a "manatee manners for swimmers" video before you swim, review a final manatee briefing, and get into the water to videotape and supervise your tour to ensure the best opportunity and manatee encounter for all. Manatees are sensitive to movement and sound, so we do not allow diving into the water, as the bubbles will scare them away. You cannot get underneath these surface dwellers, as it frightens them. On tour, we are in an average of 10 feet of water, and it is against the law to pursue the manatees in any way. So if they are sleeping or eating on the bottom, they should be left alone. It is not difficult to snorkel and most people become comfortable with this diving method. We recommend you practice in our on-site pool if you have an opportunity. This will allow you to be more comfortable in the water. Free manatee literature available upon request.